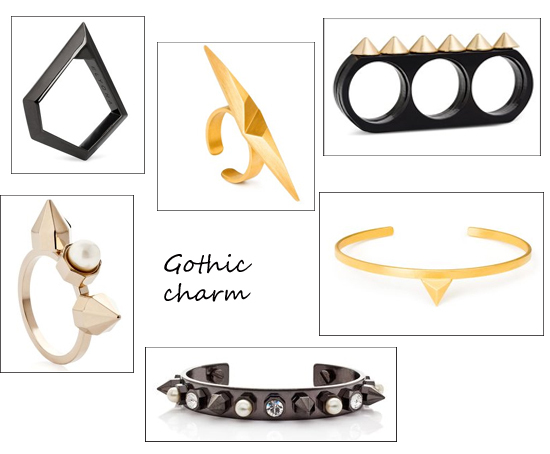 Regular readers will know that I’m drawn to edgy, distinctive jewels with a bit of attitude. I had a field day when I checked out the Wolf & Badger site and saw their jewellery section was full of spiky, dangerous looking jewels from some of my favourite jewellery designers including Maria Francesca Pepe and Elyona. As much as I love McQueen, I feel like skull detail on jewellery has been done and prefer simple spikes and angular designs to give a hard edge to outfits. There are lots of cheaper alternatives around on the high street from the likes of Topshop and ASOS, but none of the pieces below are extortionate and I like to treat jewellery as an investment. I tend to really fall for certain pieces and wear them to death, some pieces like my Arty almost become a signature so it works out pretty well on a cost-per-wear basis. My favourite piece is the Elyona pentagonal ring for it’s simplicity, it would make a bold statement on it’s own or distinctive and quirky when layered with other pieces. What’s your favourite piece?